Give your diet a 1-2 punch with the Lipo Charge weight loss solution! 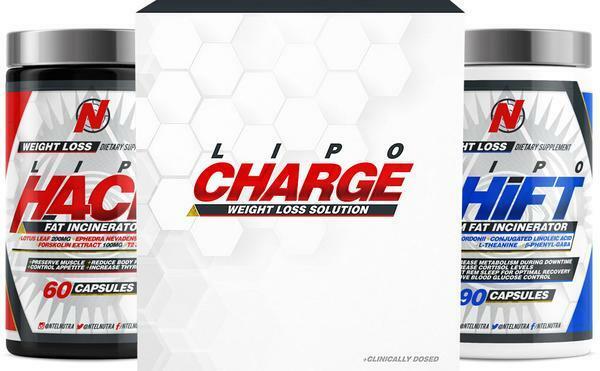 Featuring two of the most powerful weight loss products in the supplement industry, the Lipo Charge pack will kick your weight loss into high gear and help you achieve the body you've always dreamed of. 1x Lipo-Hack - a powerful stimulant based fat burner that helps you burn fat by putting your body in a state of thermogenesis (burning extra calories by raising body temperature). Lipo Hack also gives extreme energy to help you push through your toughest workouts and curbs your appetite to help prevent excess eating from hunger. 1x Lipo-Shift - The perfect weight loss stacking solution. A non-stimulant fat burner that is ideally combined with Lipo-Hack or taken as a stand-alone solution. Enhance your fat burning potential with Lipo-Shift.